2014 was a strong year career-wise and according to the Aries horoscope 2015, you will build on this strong foundation. In 2015, those born under the zodiac sign of Aries will see the benefits of their hard work pay off with increased respect and recognition. 2015 will bring financial rewards for this hard work, which will allow you to take your focus off your career goals and turn towards your personal life. It will be about balancing the personal and the professional for Aries sun sign. You will reap the rewards of all your hard work done in 2014. You will take on more authority in 2015 and you will have to learn to adjust to your new role. However, despite the challenges, 2015 looks to be a wonderful year full of new opportunities and connections. This is the time to network and to take the opportunity to meet new people and reap the rewards, both personally and professionally. While 2015 generally promises to be kind to those born under the sign of Aries, there will be some hardships as well. The first few months of 2015 will bring some relationship trials for many born under this star sign. But strong relationships will not only survive, they fill flourish. Aries 2015 love zodiac predictions foretell that you may also see some faces from your past re-enter your life and some old bonds be re-forged. It will also be a good time for you to establish new friendships and strengthen already existing bonds for the Ram. This is the time to get back to your roots and strengthen your connections. Whatever you do, do not plunge in before understanding the situation. This is also a good time for you to be forming new business partnerships, even as your personal relationships will be tested. That is not to say there won’t be any career gains for Aries in 2015, in fact it will be a good year to network and establish profitable connections that will help them in the future. As the 2015 career astrology predictions for Aries forecast, be prepared for some hard work and you will be rewarded with promotions, prosperity, recognition and respect. 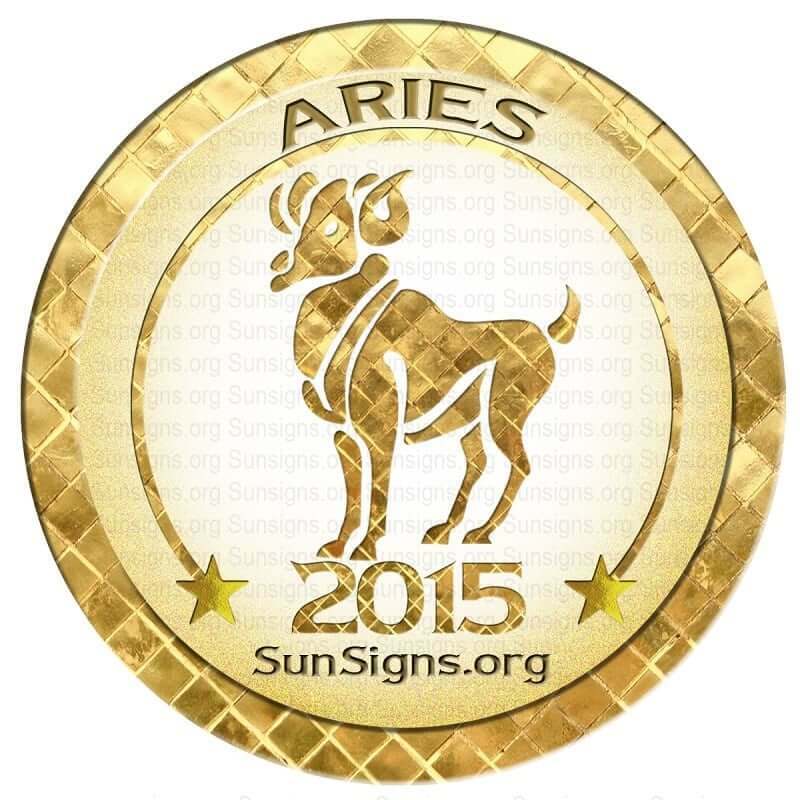 The 2015 Aries horoscope predicts that people born under this sun sign will come into great wealth this year. This will happen only due to your hard work. You will desire to earn more and thus work harder but you need to draw the line somewhere. Investments will pay off. This is an ideal time to invest in property. Do not get into speculative trading unless you know what you are doing. Aries are blessed with excellent health this year other than some minor stress related diseases. Be careful of viral infections and boost your immunity with natural healing techniques like yoga, meditation and aromatherapy. The Aries zodiac personality are always ambitious and 2015 will be no different. These ambitions can cause family and personal matters to suffer a little though, so that is something to watch for. 2015 will bring changes in the home, which could mean increased repairs, or a move, or even a change in the family structure. Whatever form this change may take, you should be prepared for it. The first half of the year in particular will be focused on these domestic changes and getting your house in order. The beginning of the year will be spent in attending to other’s needs but towards the latter part of the year you can indulge yourself in creative pursuits. Learn a new hobby that makes you happy or teach others some new skill. Take creative classes for children. Aries 2015 horoscope forecasts that your inherent urge to travel and meet new people will take you around the globe this year. January will be all about new opportunities in career and business. Love will be unstable and unreliable this month. February is set to bring relationship challenges and new business partnerships. Even now it is better if you concentrate on business rather than family otherwise it might lead to unwanted disputes. March will bring relationships, partnerships and finances to a bit of a standstill, in fact some Aries could even see a little bit of hardship in these areas. April is not the time to rush into new decisions, instead time should be taken to carefully consider these areas of your life and figure out how you can improve upon them. Family and children will take priority over work. Things will begin to improve in early May, particularly on the emotional front and it will be a time for passion and romance. Finances will improve towards the latter half of the month. In June, the scene will change from the romantic to the economic and you will be given opportunities to make money and improve your financial situation. This month you will have to face the consequences for the bad decisions made in the previous months. July will be an unfruitful month for the Aries zodiac sign. So it’s better you relax and not take any major decisions both in personal and profession life. August will be important when it comes to finding your emotional balance. Finances will be excellent. Relationships might take a hit. September is a period of reassessment and revaluation of past decisions. Take things easy and do not rush into anything without proper planning. October should see some significant changes in your personal life and emotions will run high during this period. In November you are likely to find challenges in the form of clashing business and personal lives. December will be a spiritually awakening period for the Arians. You will be all set to face the challenges of the coming year. The Aries horoscope 2015 predicts that this year, it will be all about balancing the personal and the professional. It is a year where connections will have a new importance, both in family and career. will my current marriage will be successful in future?